These are patterns made by consecutively smaller shapes. There are so many ways we could have arranged them. These are patterns that cover an entire area. They are usually associated with clothing and gift wraps. The other activity that we could have done was to make wrapping paper. 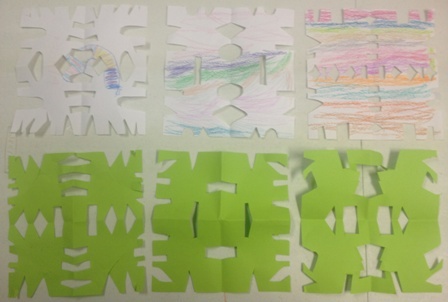 These were made by folding a square piece of paper in half then half again. Children then cut out little shapes along the 4 edges and unfolded them. These were made with geoblocks or pattern blocks. There were so many patterns that the children could have made but for some reason they figured out how to make stars. Only a few prekinders could do this without me showing them. Most of them made linear patterns with the blocks and a few would 'build' with them. But that was ok as I allowed them free play to discover for themselves. A progression from geometric shapes would be for the children to learn about tessellation.